Today I'd like announce a great new feature coming to the SyntaxEditor Web Languages Add-on (WPF, Silverlight, and WinRT/XAML versions): a XML navigable symbol provider. If you are new to SyntaxEditor, you may be wondering what is a navigable symbol provider. Navigable symbol providers allow SyntaxEditor to provide a set of drop-downs above it that indicate the current context of the caret. They also allow an end user to select items in the drop-downs to move the caret directly to the related definition. Our .NET Languages Add-on's C# and VB languages already support this feature and the two drop-downs above the editor show the current type and member context. In the screen above, the caret is on line 12 in the "id" attribute. The attribute drop-down (top right) properly shows the "id" attribute as context. If we would click the "book" element in that drop-down, the caret would move to the "book" tag's name. In this screenshot, we have displayed the element drop-down while still on the "book" start tag. It has selected the current element for us and also shows the hierarchy of elements up to the root element ("catalog"). It also shows us the elements that are direct children of the current element. In this case, elements like "author", "title", etc. are the direct children of "book". Any of the items in the drop-down can be clicked and the caret will jump right to that element. In this sense, it provides somewhat of a mini-document outline. 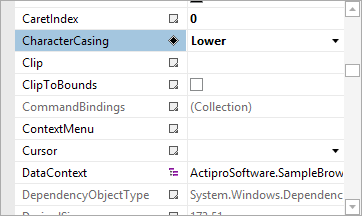 This great new feature will roll out in the upcoming 2014.1 WPF, Silverlight, and WinRT/XAML controls maintenance releases. Our WPF PropertyGrid control allows you to embed an object editing interface into your applications that can make use of any type of custom editor, including our own powerful WPF Editors controls. In today's post I wanted to review a new small, but very useful, enhancement coming to PropertyGrid in the next maintenance release: the ability to double click on a name cell and cycle through available standard values. Let's have a look at how this works. Here we have a PropertyGrid and you'll notice that the CharacterCasing property has standard values of Normal, Lower, etc. By double-clicking on the name cell, the value cycles to the next value in the standard values list. This new feature makes it quick and easy for end users to cycle through standard values without having to show a drop-down list. 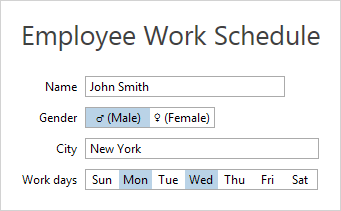 It will appear in the next maintenance release of our WPF controls. Yesterday we posted about a UniformGrid panel control that was being added to our WinRT/XAML and Silverlight Shared Libraries. This sort of panel is already available in native WPF so no implementation was necessary there. In today's post, I'd like to show another new control coming to our WPF, Silverlight, and WinRT/XAML control platforms: HorizontalListBox. The HorizontalListBox control is… wait for it… a standard ListBox that uses a horizontal layout. In fact it uses a UniformGrid panel with a single row specification to achieve its layout. This has the benefit of ensuring that each item in the list has an equal width. This sort of design is great for toggle sorts of controls where there are two or more values from which to choose. In multi-selection mode, you can also toggle each item individually. Here we have a couple HorizontalListBox controls in place. One for selecting gender and one for doing multiple selection of days of the week. Everything is simple and touch-friendly. Any content can be rendered in the list box items as well. It's the same exact control and API but here it renders in the current theme (in this case Metro Light) via our WPF Themes infrastructure. Best of all, since this restyled control simply inherits the native ListBox, you have all the features available to you that come from the base native ListBox control. Our control has some enhancements such as Left/Right arrow key navigation too. The HorizontalListBox control will be available in the next 2014.1 maintenance releases of our WPF, Silverlight, and WinRT/XAML Shared Libraries, and will be licensed for use by any of our customers of those control platforms. We've been working on some new controls and while developing one in particular that we'll post about next time, we had a need for a UniformGrid panel. The UniformGrid panel is already available in native WPF, but isn't available in WinRT/XAML or Silverlight. 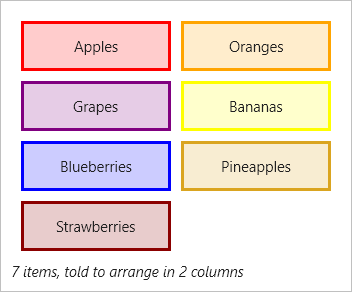 For the next maintenance releases of our WinRT/XAML and Silverlight controls, we rolled our own UniformGrid that has the same properties as the WPF version, making it easy to reuse code across platforms. The UniformGrid automatically lays out items in a grid such that the row and column counts are the same, and each item in the panel has the same size. In this screenshot, the panel has four items in it. Thus a 2x2 grid is created to display them all. In this screenshot, we have seven items so a larger grid is necessary. A 3x3 grid is used instead. You also have the option to specify a certain number of rows or columns that should be used. In this screenshot, we have specified that two columns should be used. The panel therefore creates a 2x4 grid (two columns and four rows). Note that regardless of layout, items always appear in the same size. You can see that UniformGrid provides for a lot of interesting layout scenarios, especially when you tell it a certain number of rows or columns to use. The UniformGrid panel will be available in the next maintenance release of our WinRT/XAML and Silverlight Shared Libraries and is licensed for use by any of our customers of those control platforms. 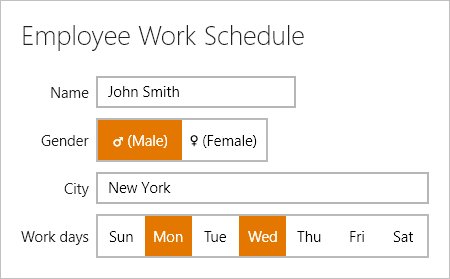 Our next blog post will show off another new control coming to our XAML platforms that makes use of this new panel. 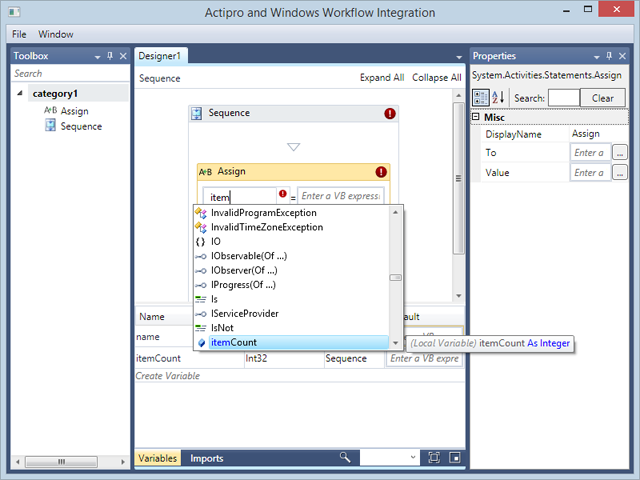 Last year, we created a sample for showing how a hosted Windows Workflow Designer instance could be integrated with Actipro WPF controls within a custom WPF application to provide a very elegant interface for end users. Our Docking/MDI product is used to provide the tool window and multiple document interface. 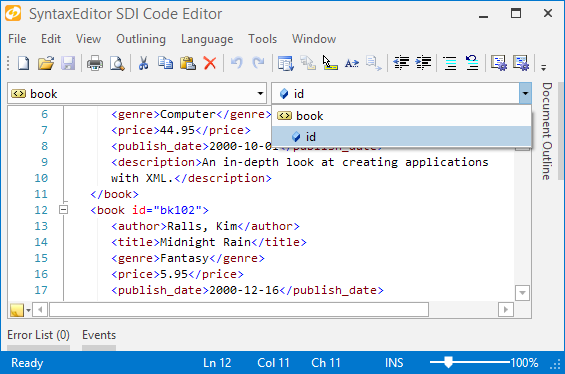 Our SyntaxEditor code editor control, in single line edit mode, is injected as a custom expression editor. When you combine SyntaxEditor with our .NET Languages Add-on, you are able to have it support powerful IntelliPrompt completion lists. For instance, in the screenshot above, you can see the itemCount variable is showing up in the completion list since it was declared below. Updated App.OnStartup code to theme native WPF controls using Actipro themes. Added a Menu above the designer with options for closing the window, and toggling the tool window visibility. Added a custom completion ListBox implementation to work around issue where ListBoxItem would steal focus on click and Workflow Designer thought that it then had to close the expression editor.